Even our treats are joining the Halloween costume fun. 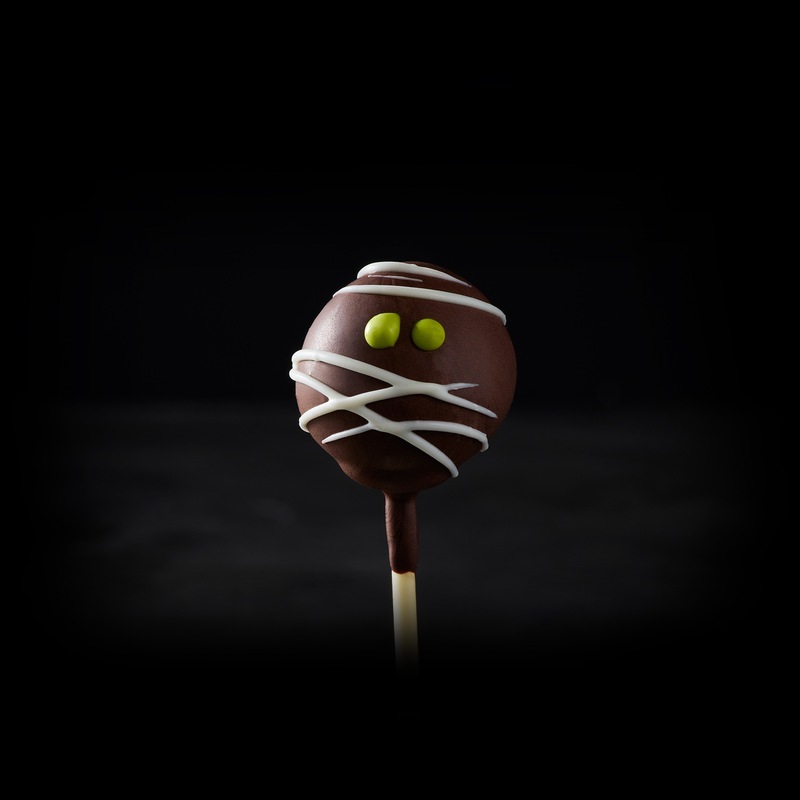 This cheery mummy is actually our vanilla cake Birthday Cake Pop, all dressed up. cake (sugar, enriched wheat flour [wheat flour, malted barley flour, niacin, reduced iron, thiamine mononitrate, riboflavin, folic acid], water, soybean oil, eggs, powdered sugar [sugar, cornstarch], egg whites [egg whites, guar gum, triethyl citrate], palm oil, butter [pasteurized cream, natural flavors], modified food starch, nonfat milk powder [nonfat milk solids, whey solids], corn syrup, invert sugar, baking powder [sodium acid pyrophosphate, sodium bicarbonate, corn starch, monocalcium phosphate], salt, vanilla extract [water, ethyl alcohol, sugar, vanilla bean extract], natural flavor, gum blend [xanthan gum, guar gum], emulsifier [water, sorbian monostearate, polysorbate 60, mono and diglycerides and 2% or less of phosphoric acid and sodium propionate], emulsifier [mono- and diglycerides, polysorbate 60, citric acid, bht antioxidant], natural flavor [maltodextrin, natural flavor, colored with annatto and turmeric]), coating (dark coating [sugar, fractionated palm kernel oil, cocoa powder (processed with alkali), soy lecithin, skim milk, natural flavor], white coating [sugar, palm kernel and palm oils, whey powder, nonfat milk powder, soy lecithin (emulsifier), natural flavor, vanilla], palm oil [soy lecithin], yellow color [turmeric oleoresin, beta carotene], vegetable juice [color]).